This could be my shortest blog post – read this book! 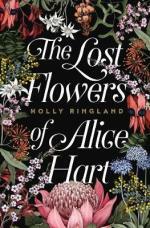 But as you may want to know why you should read The lost flowers of Alice Hart by Holly Ringland, I’ll make this post a little longer for you. From an aesthetic viewpoint, the cover and chapter illustrations by Edith Rewa Barrett are beautiful. I adore botanical illustrations, and Ringland’s book has a gorgeous cover of Australian native flowers and each chapter begins with a pen and ink botanical illustration and a brief description of a specific flower, complete with botanical name, common name and meaning for the chapter title. Really, why should illustrations stop for adult books? As you may have guessed from the title and cover, Australian native flowers feature heavily in Ringland’s book. Alice Hart loses both her parents in a fire at the age of nine. She deeply misses her fragile mother who loves gardening and has nightmares about both the fire and her abusive father. She’s taken to Thornfield, her grandmother’s flower farm, a long drive away and doesn’t talk for a couple of months. There’s a strong matriarchal history of her family at the farm, and she slowly understands her family and her place in it, surrounded by the care of the twelve women who are also working and healing at the farm, under the care of June, Alice’s paternal grandmother. June teaches Alice to use the language of flowers as a way to communicate the words that are too hard to share. There are many secrets and many unspoken words at Thornfield. The second half of the book focuses on adult Alice, as she falls in love, has her heart broken and leaves Thornfield. Ringland explains the editing process by Harper Collins, Fourth Estate, in this short video clip, where she states that she needed to go a little deeper into some of the more difficult chapters to write which she had been avoiding. Her editor helped her to look at these chapters more clearly. This book rings with authenticity and authority. It’s one of my favourite reads for 2018 – maybe it will be one of your favourites, too! I thought “Lost Flowers” was a beautiful read about some sadly damaged characters whose lives interact through tragic circumstances. It would make a lovely gift or great discussion at Bookclubs. I came away from it thinking there were some hanging threads and maybe a further novel from this amazing writer will hopefully eventuate. Karen thank you for the great little video clip..great insight into what a good editor does to guide an author. Thanks for your thoughtful comment, Shirley. I bought a second copy of this book for our bookclub swap, so we can read it for the next year – it is an excellent book to discuss!